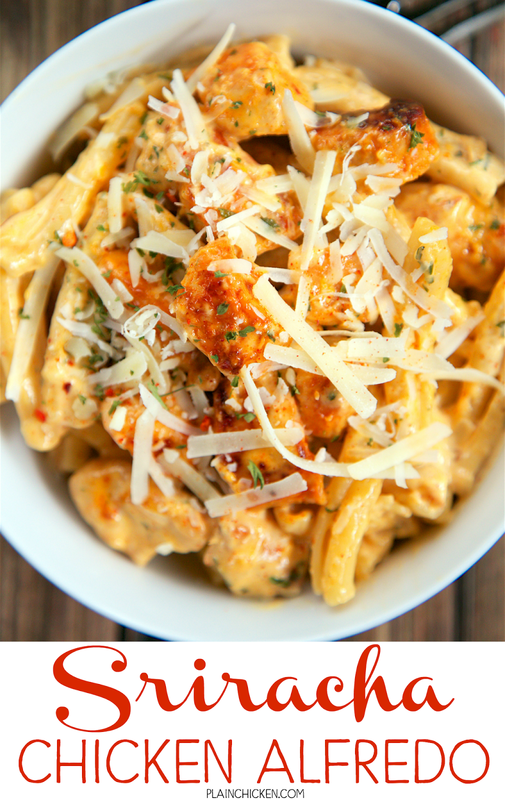 Sriracha Chicken Alfredo - super quick pasta dish that is ready in 15 minutes and requires no prep work! Chicken, sriracha seasoning, garlic and onion powder, heavy cream, parmesan cheese and pasta. We can not get enough of this simple dish!! It is SOO good!! I wanted to lick my plate! Serve with a salad and some crusty bread for a quick and easy weeknight meal! 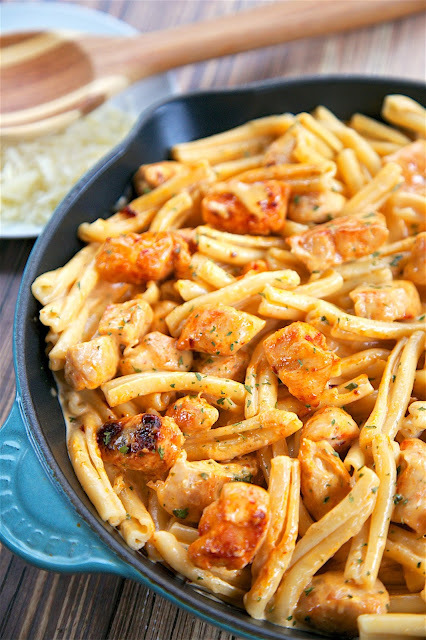 We am completely obsessed with this Sriracha Chicken Alfredo! We can not get enough of it!! It is crazy delicious. 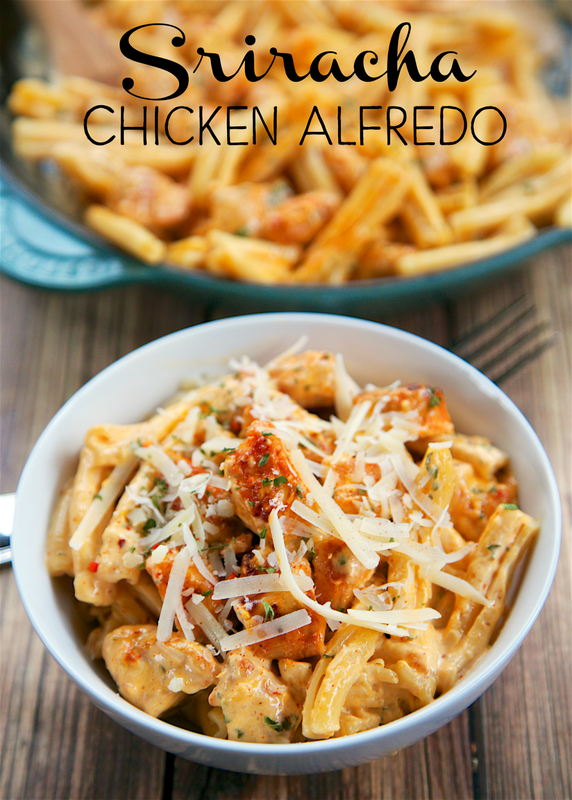 We absolutely loved the flavors in this super quick pasta dish. 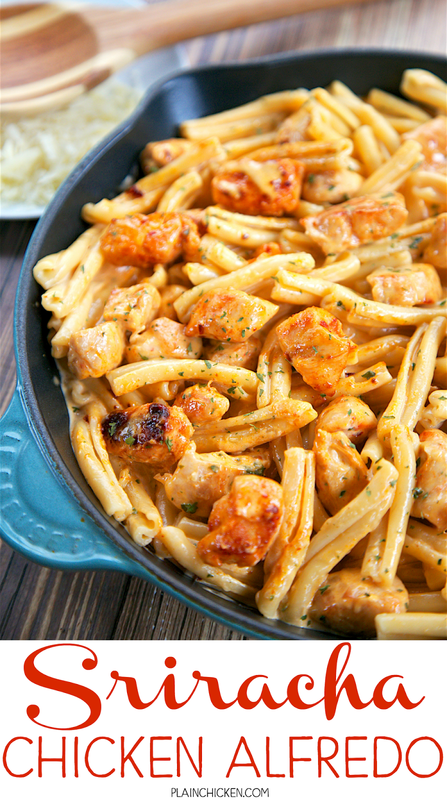 The Sriracha flavor in this dish comes from the new McCormick Gourmet Sriracha Seasoning. I saw it in the spice isle and knew I had to make something with it. It is a great substitute to ordinary chili powder. 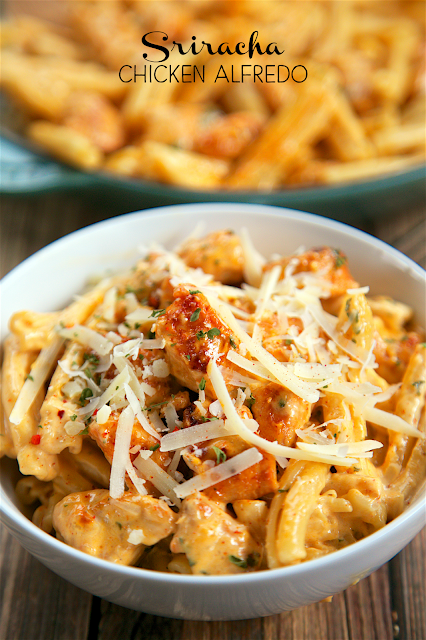 This Sriracha Chicken Alfredo is ready in about 15 minutes and requires no prep work. LOVE! I got the pasta water going and started cooking the chicken. Once the pasta was done, I tossed everything together and dinner was ready. So easy! We served this with a side salad and come crusty bread. This is already on our menu again this week! Cut chicken tenders into bite-sized pieces. Combine sriracha seasoning, garlic powder, onion powder and salt. Sprinkle seasoning mixture over chicken. Sauté chicken in a large skillet over medium-high heat for 5 minutes in olive oil, turning occasionally. Add cream; bring to a boil. Reduce heat; simmer gently for 3-4 minutes or until mixture begins to thicken. Remove from heat, stir in Parmesan cheese and dried parsley. Add pasta to sauce and toss. What kind of fun pasta shape is that? I don't remember the exact name and it isn't in my pantry. I'll look when I go to the store later today. What an awesome way to spice up your dinner! Yes! I could eat this every night! I have a bag of frozen shrimp I've been trying to think of something to make with v it. I think this would be perfect! I described it above in the post. It is in the spice isle. Made this tonight for dinner and it was AMAZING! Thank you! I've made this a few times for my boyfriend and we devour it every. time. Last night I used pre-packaged shredded chicken from the store to save on time; sauteed some sliced bell peppers, adding them to the pot once the heavy cream had thickened. I also sprinkled the top with crushed red pepper for added heat. Yum! !